Apoptosis is programmed cell death characterized by nuclear condensation, cell shrinkage, membrane blebbing, and DNA fragmentation. Caspases, a family of cysteine proteases, are the central regulators of apoptosis. Initiator caspases (including caspase-2, -8, -9, -10, -11, and -12) are closely coupled to pro-apoptotic signals. Once activated, initiation caspases cleave and activate downstream effector caspases (including caspase-3, -6, and -7), which in turn execute apoptosis by cleaving targeted cellular proteins. 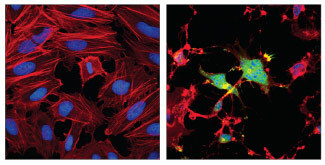 Confocal immunofluorescent analysis of HeLa cells, untreated (left) or treated with Staurosporine #9953 (1 μM, 4 hr; right), using Cleaved Caspase-3 (Asp175) (D3E9) Rabbit mAb #9579 (green). Actin filaments were labeled with DY-554 phalloidin (red). Blue pseudocolor = DRAQ5® #4084 (fluorescent DNA dye). 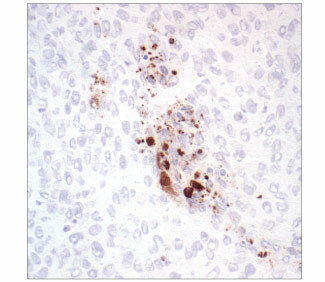 Immunohistochemical analysis of frozen H1650 xenograft section, using Cleaved Caspase-3 (Asp175) Antibody #9661. 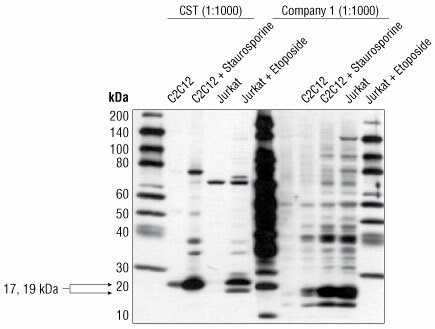 Western blot analysis of extracts from C6 (rat), NIH/3T3 (mouse), and Jurkat (human) cells, untreated or treated with staurosporine #9953 (1uM, 3 hrs) or etoposide #2200 (25uM, 5hrs) as indicated, using Cleaved Caspase-3 (Asp175) (5A1E) Rabbit mAb #9664. Function: Activation of caspase-3 requires cleavage at Asp175 into the activated p17/p19 and p12 protein fragments. 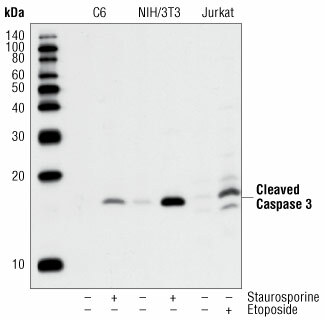 Samples: Jurkat cells were treated with etoposide, an anti-cancer agent that is commonly used to induce apoptosis. CST Cleaved Caspase-3 (Asp175) (5A1E) Rabbit mAb #9664 recognizes the activated large fragment after cleavage (seen as a 17 kDa and 19 kDa doublet on western blot). 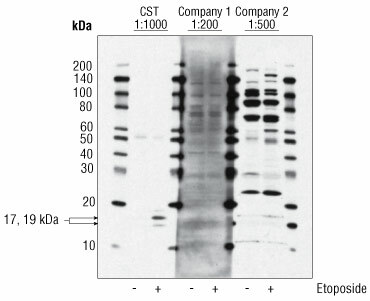 Company 1 cleaved caspase-3 rabbit polyclonal antibody shows high background and does not detect distinct bands in the expected 19/17 kDa range. Company 2 active caspase-3 rabbit polyclonal antibody detects multiple non-specific bands at various molecular weights but weakly detects the bands of interest in the 19/17 kDa and 12 kDa range. The data using this antibody is not conclusive. Samples: Jurkat cells were treated with Etoposide, an anti-cancer agent that is commonly used to induce apoptosis. C2C12 cells were treated with Staurosporine, a PKC inhibitor that induces apoptosis (1 μM for 3 hours). CST Cleaved Caspase-3 (Asp175) (5A1E) Rabbit mAb #9664 recognizes the activated large fragment after cleavage (seen as a 17 kDa and 19 kDa doublet). Company 1 active caspase-3 rabbit monoclonal antibody detects multiple non specific bands at various molecular weights. The antibody recognizes only the 17 kDa band corresponding to one form of the large fragment of cleaved caspase-3. The non specific binding of the antibody may make data analysis challenging.